← CDC #401 – Winging It! 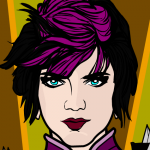 First up, what will become the Valkyrie under suit is here! 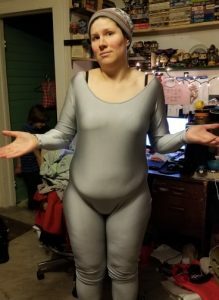 I went with a dance-type bodysuit instead of a zentai to try and get something a little thicker and without the hands, feet, and head. I find it’s a little more off-the-shoulder than I was expecting but there’ll be some addition to it to bring the neckline higher anyway. 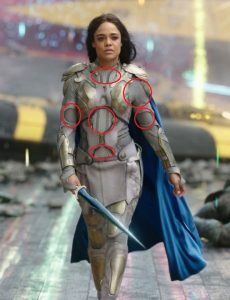 The next step for this, other than bringing up the top, will be adding the texturing that the Valkyrie undersuit has, probably with some manner of fabric paint. I also found this amazing tweet with what appears to be concept art and I love this helmet. I did want a helmet, but one that was in line with the style and not too over-the-top. This might have to happen, folks. It’s so shiny! And you’ll still be able to see my hair/wig with it! 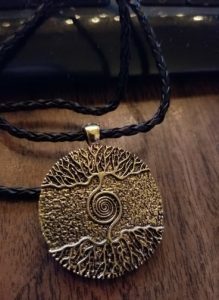 An Yggdrasil necklace. I looked at several while I was perusing, and this was the one I liked best (since this will be something I wear not just for cosplay, but also just for funsies). It’s also more stylized than some of the other ones I looked at, and I think it’ll go better with the overall MCU Asgard aesthetic. 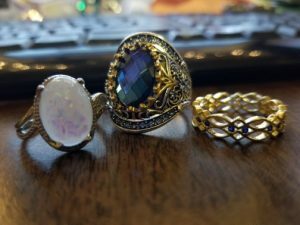 Rings! I have quite a few, and like I said, at least one more on the way. In at least the first Thor film, Frigga wears a large ring on her right hand. 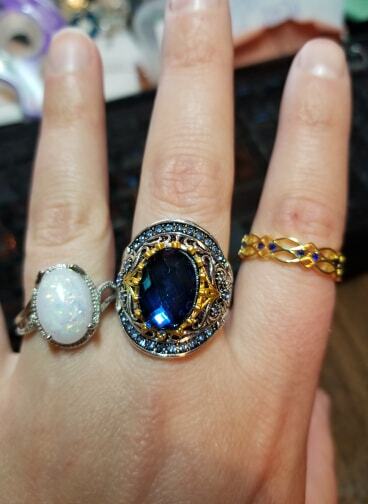 It’s hard to get a good picture of it, but there seems to be some kind of stone in it, possibly white/moonstone-y. The others, whichever ones I end up going with, will be my interpretation from there. 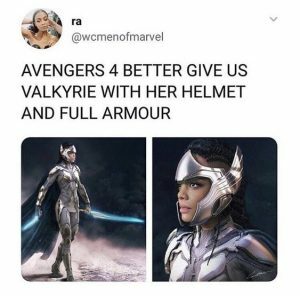 Especially since Valkyrie in Ragnarok wears no jewelry, even in the flashback scene. So, I’ve got a couple of things for this so far. 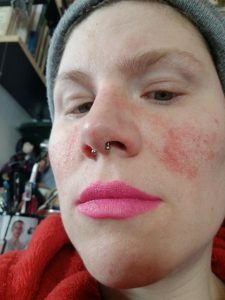 First off, lipstick! 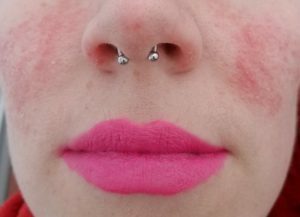 I got a lipstick set for my birthday which just so happened to have a lovely bright pink in it that I think will look perfect. 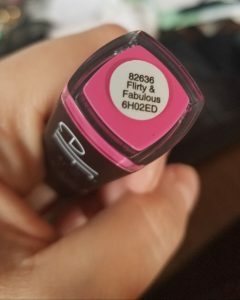 This is the color, for reference. It’s from e.l.f, a company I’ve bought quite a bit from before. In fact, I’m waiting on an order that’ll have some contour stuff in it to use for this cosplay as well as for Casual Loki. Also, stockings! They don’t stay up quite as well as I’d hoped, but I only put one on long enough to take a picture, so we’ll see. Apologies for the weird angle, it’s hard to take pictures of your own leg and have it look okay. So, that’s it for now! Hopefully will have a better post later when I’m back up to it, because I’ve literally written this on and off all day. I’m feeling somewhat better, and hopefully will be back in fighting form by tomorrow. See you all later! 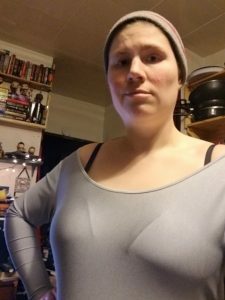 This entry was posted in Cool Characters, Movies and TV and tagged 2019, cosplay, costume, geek, Marvel, music. Bookmark the permalink. Look at the possibility of junkyard automotive rubber gaskets from old trim for the black / gray shapes? Good luck.